Hello again lovelies! It’s Friday, it fun-day and it’s a giveaway! Yes, The Makeup Examiner has scored another exclusive giveaway for readers. Hourglass Ambient Lighting Powder just made Sephora’s “Hot Now” list, but before TME was willing to offer her beautiful readers an opportunity to win anything, she had to make sure that Hourglass puts the art in state-of-the-art, as they say. So you may be asking, “What is Hourglass Ambient Lighting Powder?” Aside from a product that is flying off of the shelves, it is a makeup wardrobe of six finishing powders ($45 each) designed to create a perfect canvas and capture the most flattering light for your face. Each of the six Hourglass Ambient Lighting Powders is highly pigmented, with a luxurious consistency and absolutely creates the effect that one is seeking. 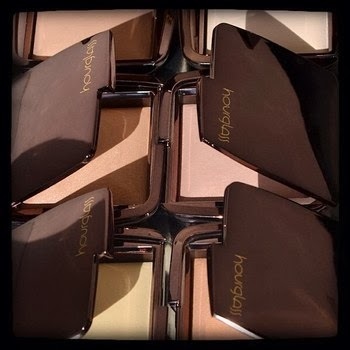 The Ambient Lighting Powder is of the precise level of quality that The Makeup Examiner has come to expect, and love, from Hourglass Cosmetics. “But, how does it work?” you ask. This, dear readers, is kind of mind blowing. The various powders mimic six universally flattering light sources! Hourglass delivers this by utilizing “photoluminescent technology,” which are micron-size, color-correcting particles that refract light and create transparent coverage. And as with all Hourglass products, Ambient Lighting Powder is paraben free, talc free, gluten free and never tested on animals. Sounds amazing, doesn’t it? After all, Hourglass puts the art in state-of-the-art! Well, six (6) lucky readers will win one (1) of the six Hourglass Ambient Lighting Powder effects. Are you ready to win? To enter, email TMEGiveaway@gmail.com with the subject line: Hourglass Cosmetics Ambient Lighting Powder Giveaway! Finish the sentence; “Hourglass puts the art in _____”. And don’t forget to include your name and address! Giveaway ends Wednesday, July 31, 2013 at 11:59 p.m. (ET). For complete terms and conditions, visit TME Giveaway Rules. Hourglass Ambient Lighting Powder is available at Sephora nationwide.